Because I know Him. I have a personal relationship with the Lord. And it bothered me on a couple of levels. Mostly because it's just disrespectful to the millions of people who believe in a higher power. Even if you don't believe in God, there's no reason to be disrespectful about it. And then, it's troubling because someone whose mind is that closed to the possibility of a higher power, well... it's just frustrating to see anyone's mind closed that tightly. So how do I know there's a God? Because I know Him. I have a relationship with Him. I talk to Him & He talks to me. I feel His presence. 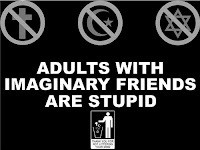 Someone arguing with me that God does not exist is like someone trying to tell me that... I don't know... my daughter doesn't exist. Or any number of people that I have real, tangible relationships with. I see His work in my life on a regular basis (details coming in a later post). I have literally felt His presence. I know that for some of you, who have never experienced this, that this is difficult to grasp, hard to understand, and I'm sure someone out there will read this and think that I must be crazy, but... it's real. God is real. Look at a sunset, and tell me that was a happy accident of nature. Fathom the complexities of the human body, and tell me that no higher power had a hand in its design. God is, and God is everywhere. This is going to be a huge 2-part comment response that will eventually be its own blog post on my own site. I propose that we open an honest discussion about this on our respective blogs, just to provide some opposite perspectives. Could be fun, think about it. Maybe we can trade guest blog posts. How is this any more disrespectful to the religious among us than your post claiming that "marriage is between husband and wife and god. Whether you acknowledge him or not" is to the non-religious? I personally find it disrespectful that people insist on inserting their god into everyone’s life, regardless of their belief system. As a non-believer, heck, as a social liberal, religious non-belief aside, it's frustrating to see people's minds closed tightly to women's rights issues or gay rights issues and other social issues like that because a religion tells them that a certain behavior or way of life is wrong. The agnostics and atheists I know are some of the most intelligent and socially-conscious people I've ever met, I'm sure in part because they aren't limited to a particular view on things because of their religious mythology. That's all fine and good that you know there's a god. Good for you, and good for everyone else who believes in a god. However, my own personal knowledge tells me that there is no god. I'm not one to argue this point with people. We're all entitled to our own beliefs (or lack thereof), and who am I to say that my belief is better than yours? That's part of what makes America "special," we're all free to believe (or disbelieve) as we see fit. I would never try to talk someone out of their religious beliefs or try to show them that it’s better for them not to believe in god. Unfortunately, in our society non-believers are rarely afforded the same respect. It’s not the same as someone trying to tell you that your daughter doesn’t exist. The scientific method can tell us that she does. Simple observational methods and reasoning can tell us that yes, she exists. Science can’t prove that god does (or does not!) exist. That’s where faith comes in. I’m happy for you that you have faith that your god exists and that your god is always present and that your god guides your life. However, I don’t share your faith. People of other faiths don’t share your faith. Who is anyone to say that their god is the only one true god and that everyone else is wrong? I don’t think you’re crazy for your faith and beliefs. If you’re crazy, then so is 90+% of the rest of the world, including family and friends who are very dear to me. Religion and gods serve a very important purpose in society. They always have, even before the dawn of Christianity. They always will, because people always need a community, they always need a belief structure, they always need security, they always need to have a way to explain the natural world around us. Religion can provide you with all of that. But for some of us, we’re ok without that fancy stuff. We’re cool with scientific explanations and the idea that the natural world is just simple matter, explainable and quantifiable by experiments and logic. I’m the first person to admit that I wish I could give my son the neatly-wrapped package that is Heaven when he starts asking questions about death and dying. It would certainly be more comforting than to tell him “I don’t know what happens when we die.” The idea that our loved ones are peeking out from behind a cloud and that one day we’ll be reunited is tempting, for sure. But I know that I don’t really believe that, so I won’t perpetuate the myth – what I see as a very nice story. As I said in my first comment (and I apologize for taking up so much comment space), I would love to discuss the issue further at some point.